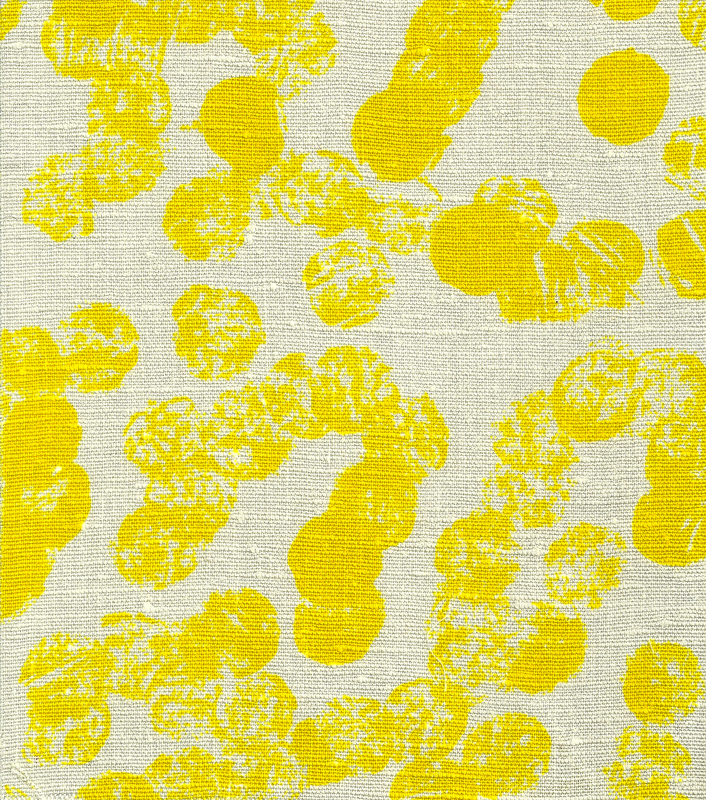 Congratulations to those of you who picked this fabric in my Quiz #2! I promise this will be the last time I show this pattern evelope! Before I actually began work on the dress, I looked up Jacques Heim in one of my favorite reference books, The St. James Fashion Encyclopedia: A Survey of Style from 1945 to the Present. “Mr. Heim’s fashion house designed and made clothes of a modest style…” (p. 186) It appears he was not a great innovator, although he was interested in many styles, and his loyalty to a ladylike interpretation of those styles gave him staying power over his 45-year career. 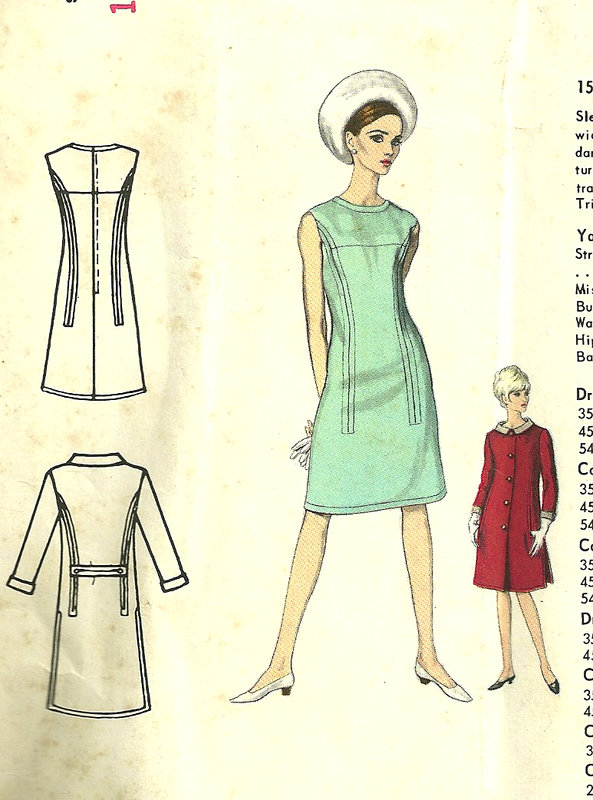 Vogue Patterns started featuring his designs in the early ‘50s as part of their designer series. It was interesting to go through some of my Vogue Pattern Book magazines and see the progression of his fashions. 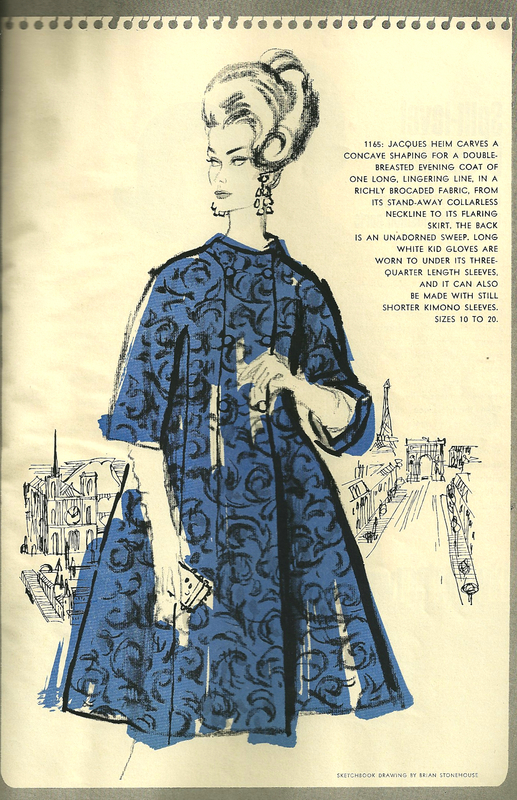 This dress was featured in the June/July 1957 Vogue Pattern Book magazine. 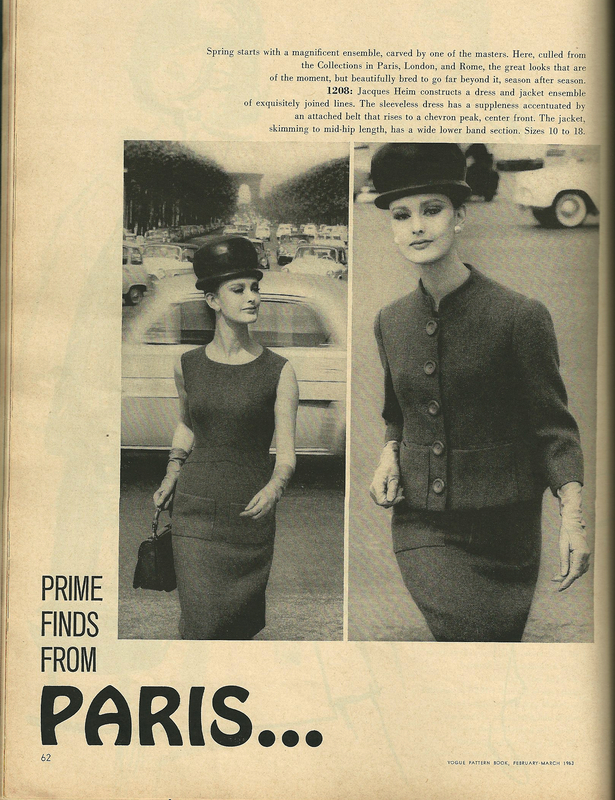 This ladylike suit was pictured in the August/September 1958 issue of the Vogue Pattern Book magazine. 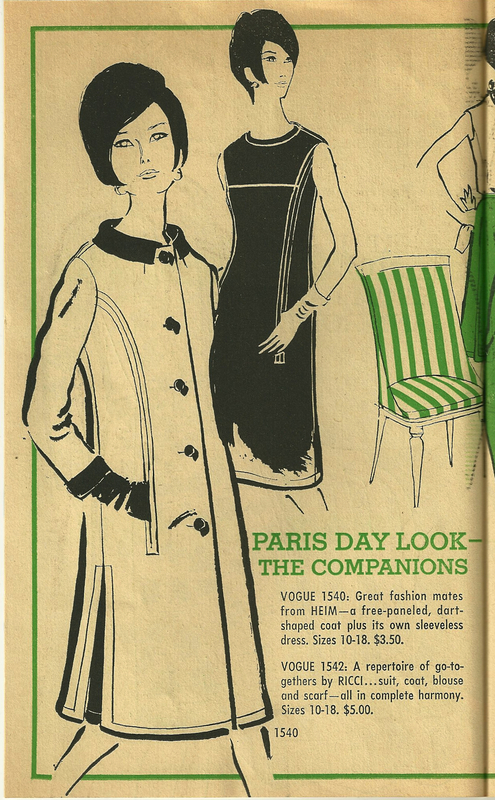 Here is a Jacques Heim evening coat from the August/September 1962 Vogue pattern Book magazine. 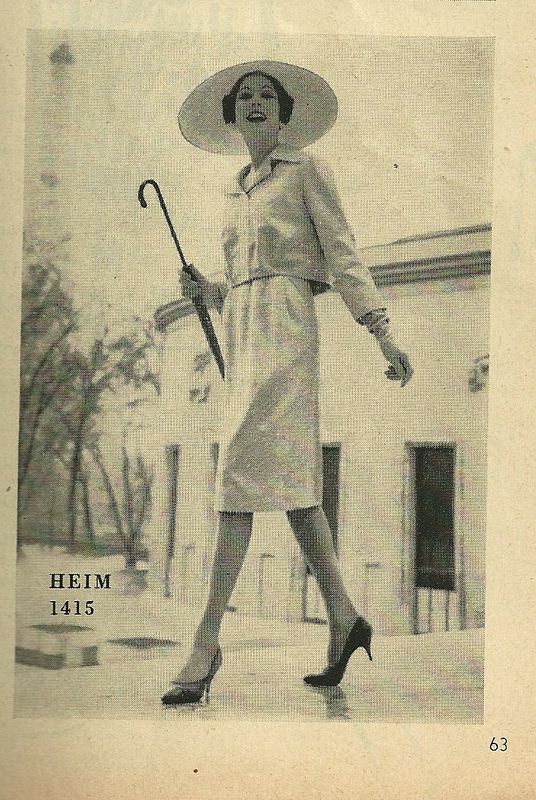 This ensemble was one of Mr. Heim’s February/March 1963 designs. The waist on the dress has a set-in chevron-peaked belt detail. Very lovely! The pattern I chose was actually featured in one of the free “flyers” which were available in fine fabric stores in the ‘60s. It is dated Fall 1966. I just happened to find this copy on eBay – no one bid against me, so I guess I was meant to have it! I felt very lucky to find this item on eBay! Note the hair-do. Mr. Heim died in early January 1967, so this particular pattern must have been one of the last ones which he designed or which was designed under his name before his death. His fashion house then only lasted for 2 more years, closing operation in 1969 . 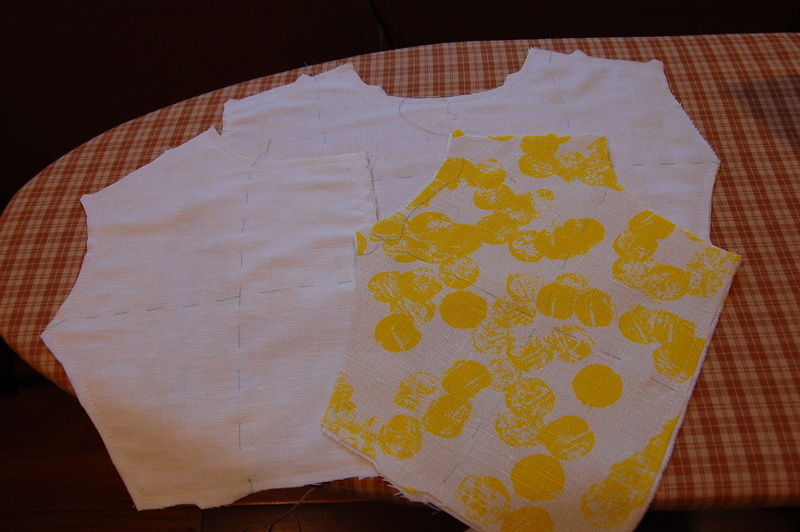 So – now on to construction of my dress. I made a muslin of the bodice yoke so I could check on the neckline and shoulder line, both of which seem to be an ongoing challenge for me with these vintage patterns. Although the neck seemed to be okay, the shoulder line appeared to me to extend a little too far out over the shoulders. 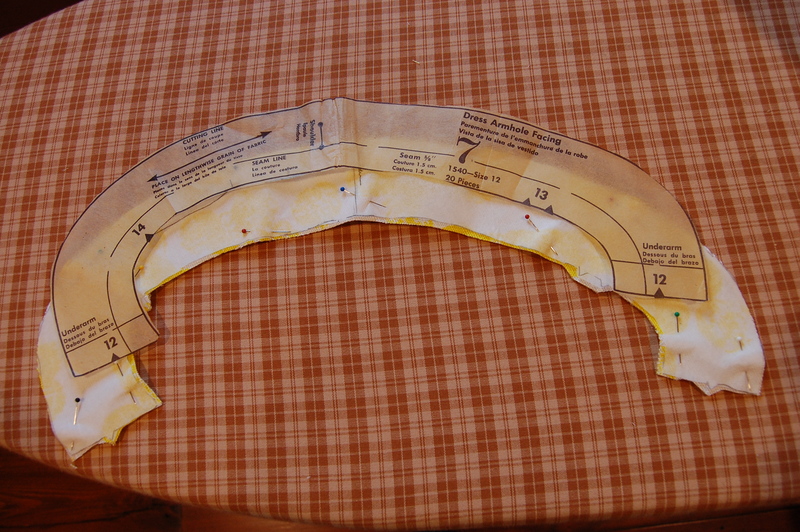 So I re-cut the pattern piece, which meant that the facing had to be re-cut as well. I had to extend the length of the armhole facing to accommodate my changes to the shoulder line. 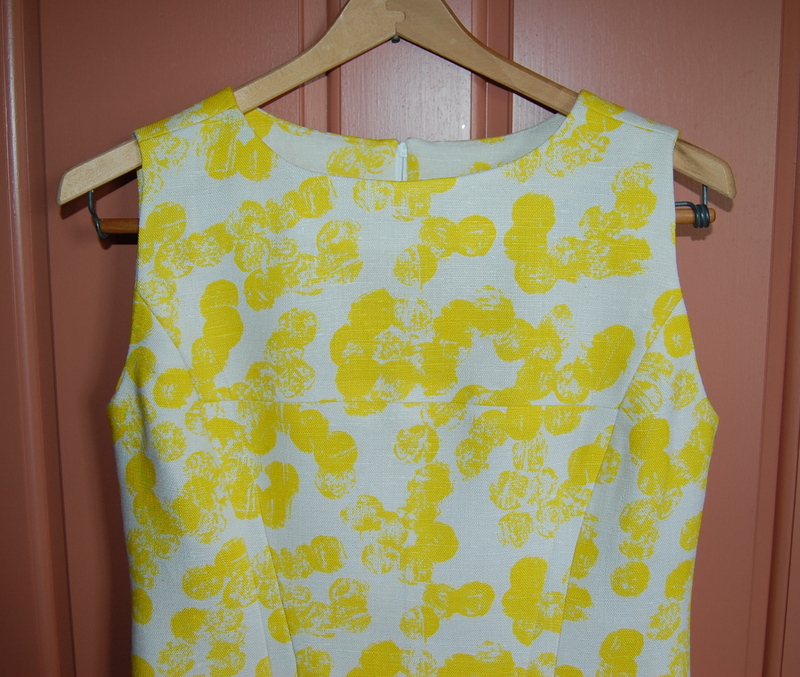 The pattern called for the dress to be interlined, for which I chose a lightweight linen/cotton blend. I basted all the pieces together by hand, kind of in a grid before machine basting them together just inside the seam lines. 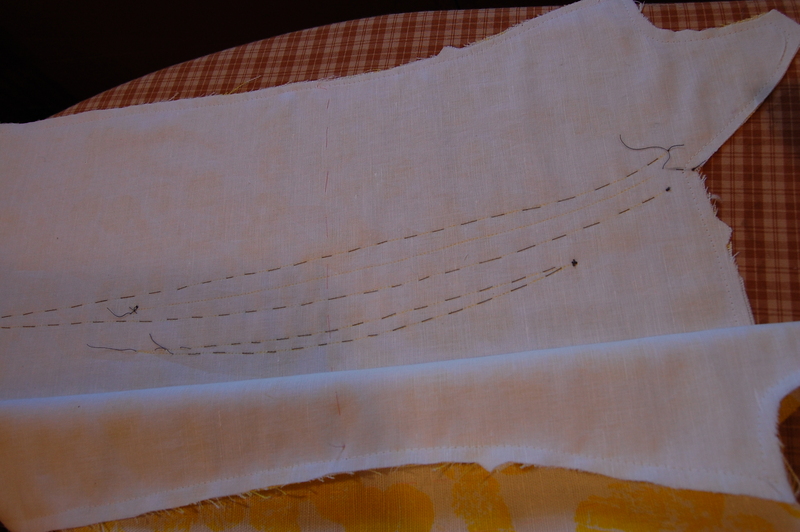 I also basted all the dart lines, as indicated on the pattern instructions. 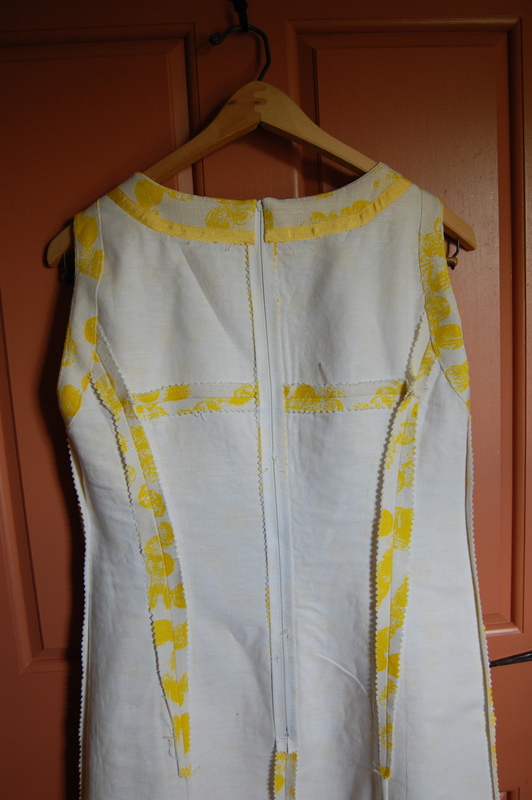 Here are the “bodice/yoke” pieces shown with their underlinings. This shows my basting stitches on the dart lines. As I got near to the end of the construction, I was very happy that I had re-cut the shoulders, but I began to sense that the neck was going to be a problem. After I had the facings in the armholes, I tried the dress on, and yes, the neck was tighter than I wanted it to be. 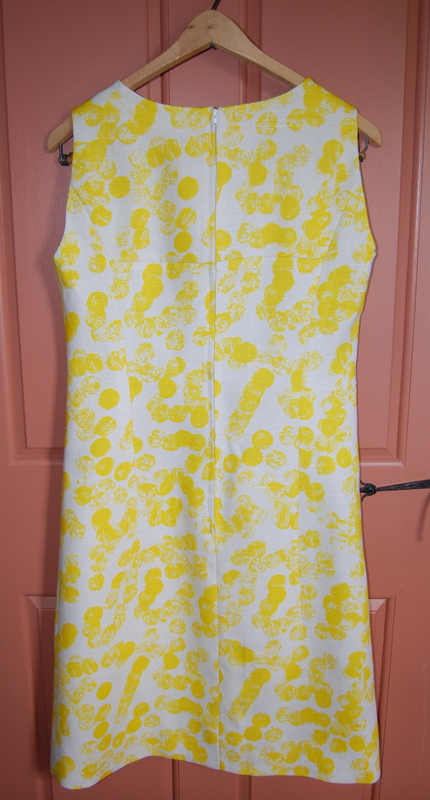 I cut off the 5/8” seam allowance on the neckline and the matching part of the facing, which made it perfect! I had just enough of this yellow vintage seam tape to do the neck. It makes a nice flat finish. I sometimes do the understitching on the facings by hand. If you click on the photo, you can probably see this detail. It’s time-consuming, but makes a nice finish! Finally, for anyone who’s interested, here’s the inside story! 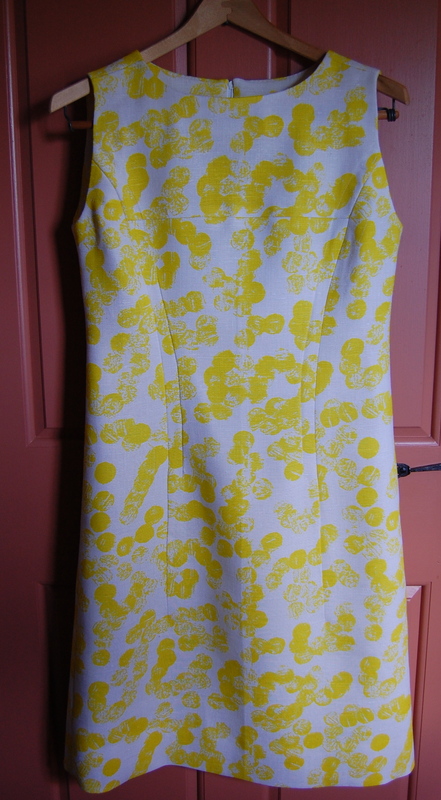 I really like this dress – it’s cheery, comfortable and casually dressy – what more could one ask for? It’s beautiful – inside and out! Don’t you just love it when an alteration is as simple as trimming off the seam allowance?? That fabric is gorgeous in the close-ups and I’m sure the photos don’t do it justice. Thank you, Brooke! 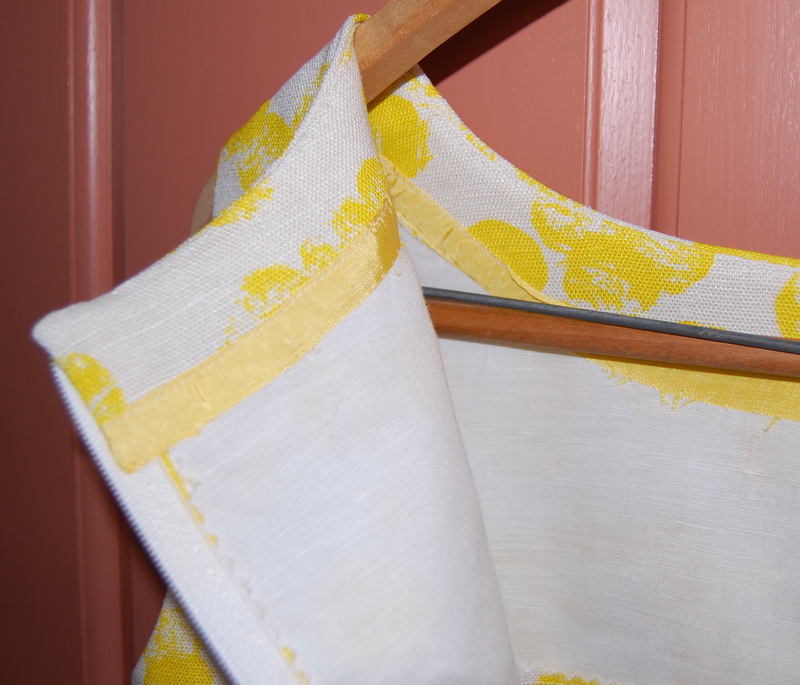 Moygashel linen is a dream to work with – and it always looks so crisp and perky! I’m just really happy with this project! I am new to your blog, and I am over the moon with your expertise regarding this fabric, and moreover, the beautiful dress resulting from your meticulous efforts. You are a true disciple of the methods of a designer and the results of an artist. Thank you for allowing my Mother’s fabric to play a part in this project. It’s awesome. I will be following you through to your next goal project. Beautiful meticulous work! What a lovely dress. Thank you, Mary! You may just see me in it sometime! Thank you, Tish, for such a thoughtful compliment! I should let my other readers know that it was in your Etsy store, Luxury Life, where I found this yellow patterned linen. That was my lucky day! Sewing seems to brings the nicest people together!